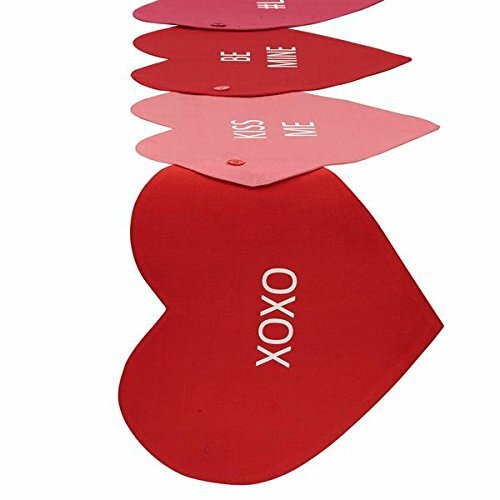 Heart shaped placemats that buttons together to make a table runner. Made of felt; NOTE: Hand wash cold; Line dry; Low iron. 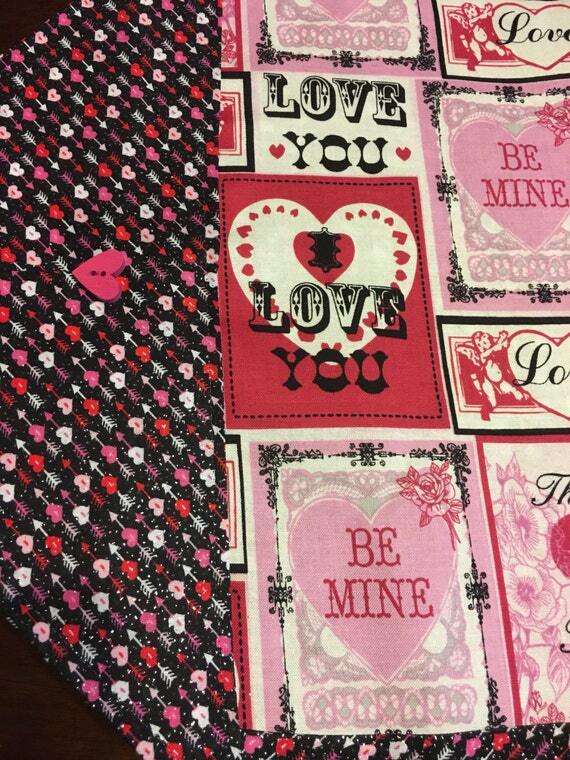 Design:The fabric is thick, firm and wear-resistant, good wrinkle resistance, strong heat resistance, exquisite printing process, personalized DIY printing design, customized personalized table matching. 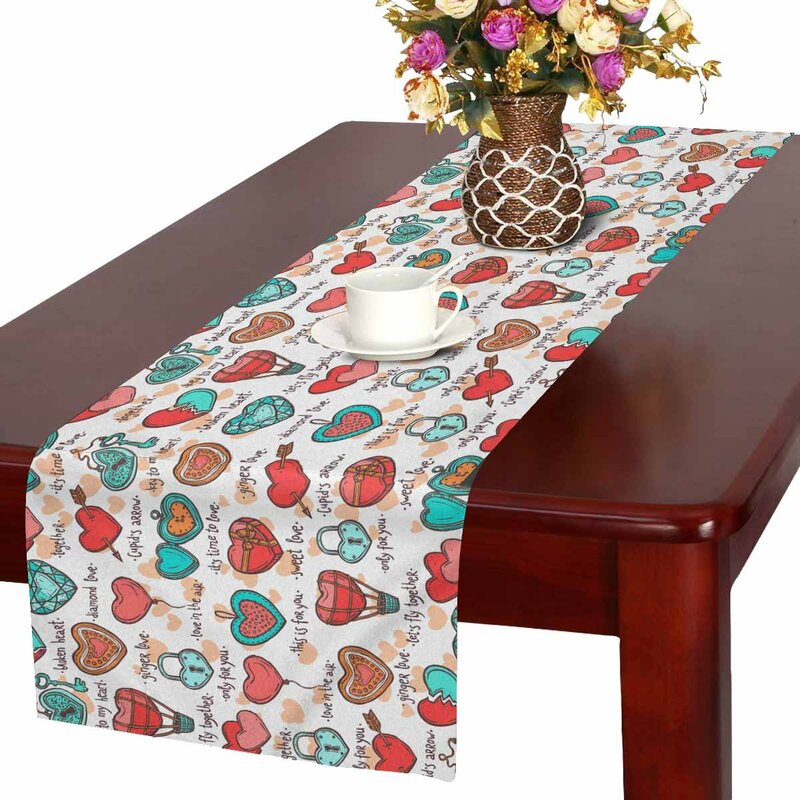 Feature:This Table Runner is suitable for most rectangular table, round table, and square table, and it not only can decorate dining table but also tea table, shoe cabinet, and TV stand, etc. Enjoy this Table Runner. 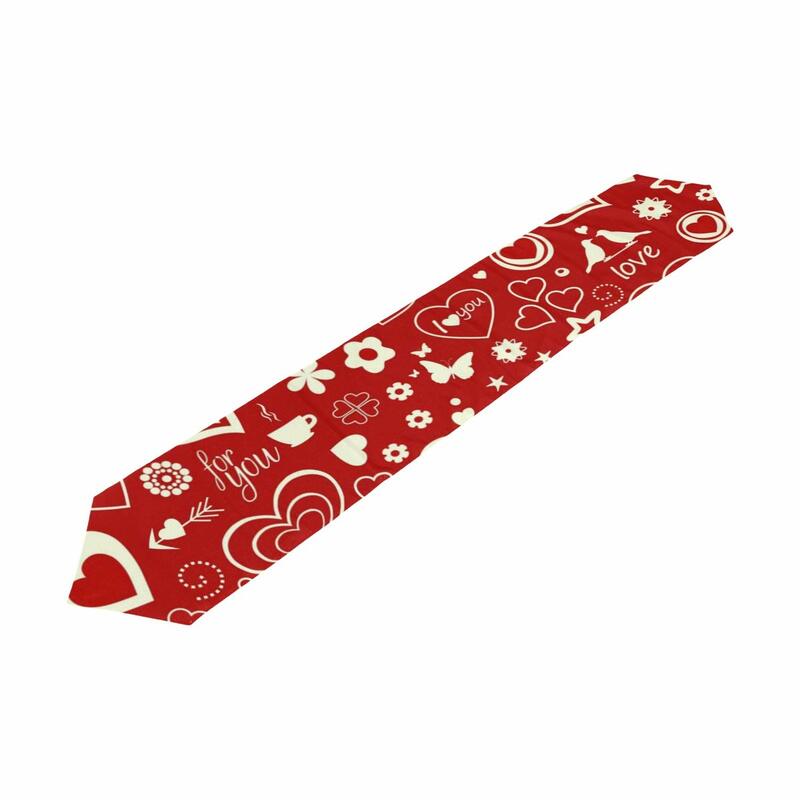 This Valentine’s Day runner is Fun! 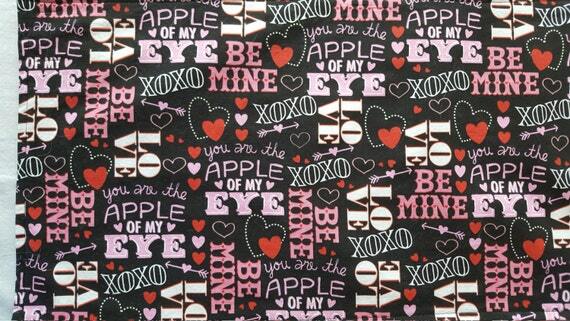 It has hearts & X’s and O’s on a black background & says things like “Be Mine” & “Apple of My Eye.” The back side is solid black. It’s wonderful! This runner is versatile & can be used on a sofa or coffee table, entertainment center, dresser, etc. It measures 12″ X 41″. The ends are squared & there is a medium weight stabilizer between the cotton print fabrics to help it keep its shape. The runner has also been topstitched for durability. 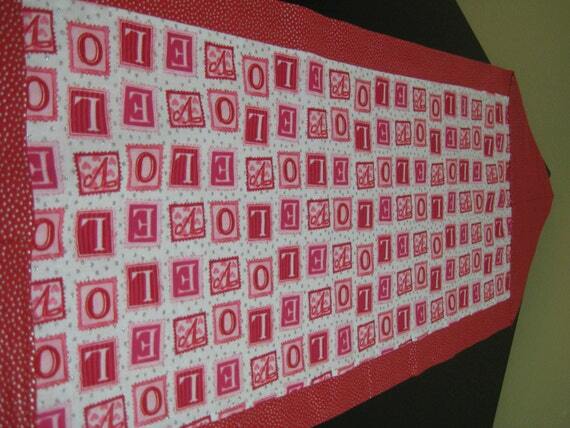 A great table runner centerpiece for your table. 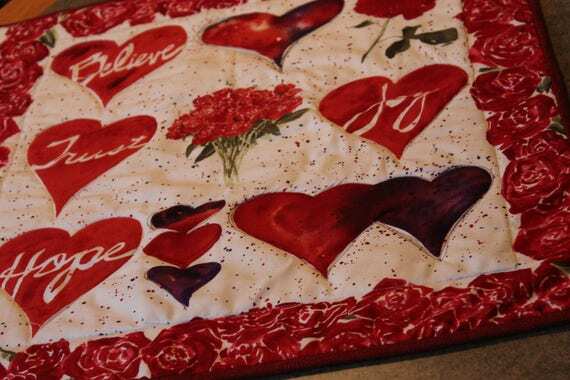 The black background center panel has red, pink and white hearts and flowers and “Words of Love” abound. 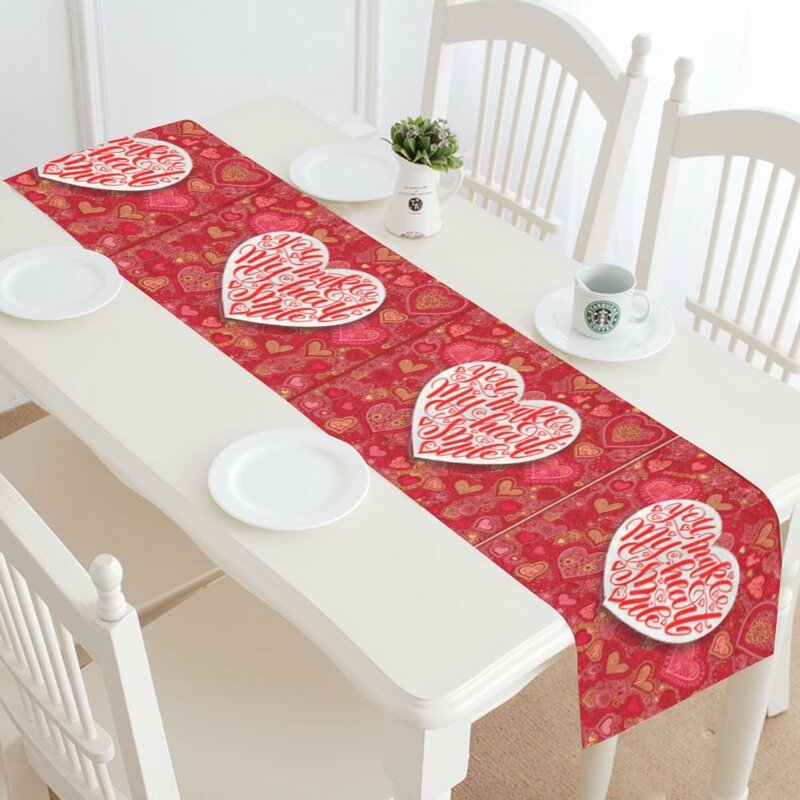 It will surely give your table a festive look for Valentines Day. It is bordered with a soft pink with small hot pink dotted cotton fabric which wraps around to the back. What a way to treat yourself or it would make a great gift. The runner measures approximately 12 1/4 by 41 1/2 inches. There is no batting in the runner which allows it to lay flat on the table. Could be used as a wall hanging. Made in a smoke free, pet free environment. 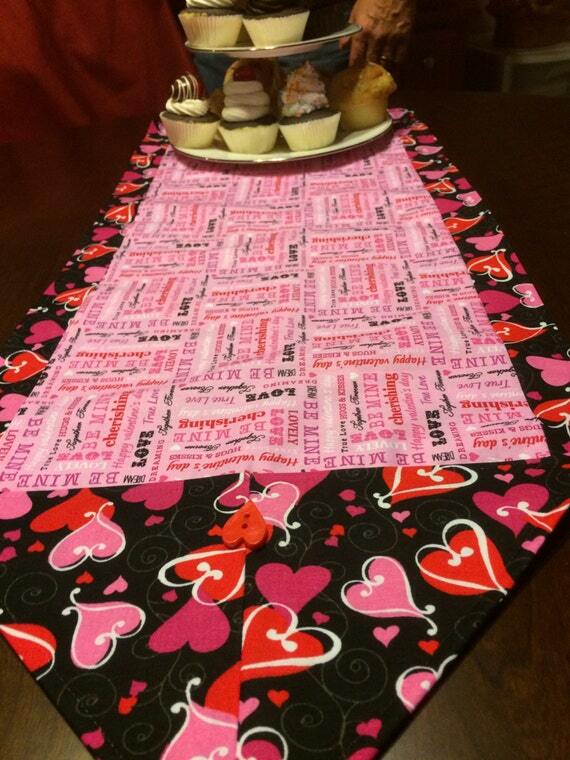 This table runner topper was made by me using quilt shop cottons, cotton batting and a cotton backing. 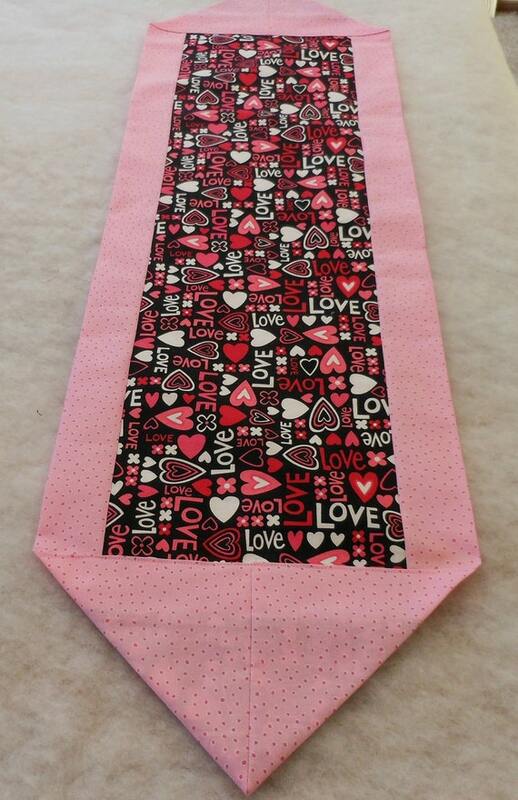 The inner rectangle on this runner is a black background covered by pink and red hearts. The outer edges and ends are hot pink. The black button coordinates. 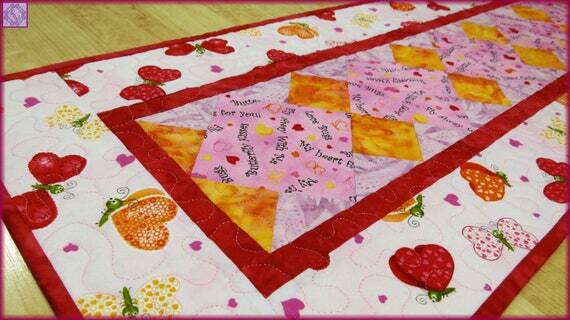 This is a fun quilted patchwork table runner that will get your home in the mood for Valentine’s Day. Measures 30.75″ X 13.25″ approximately. 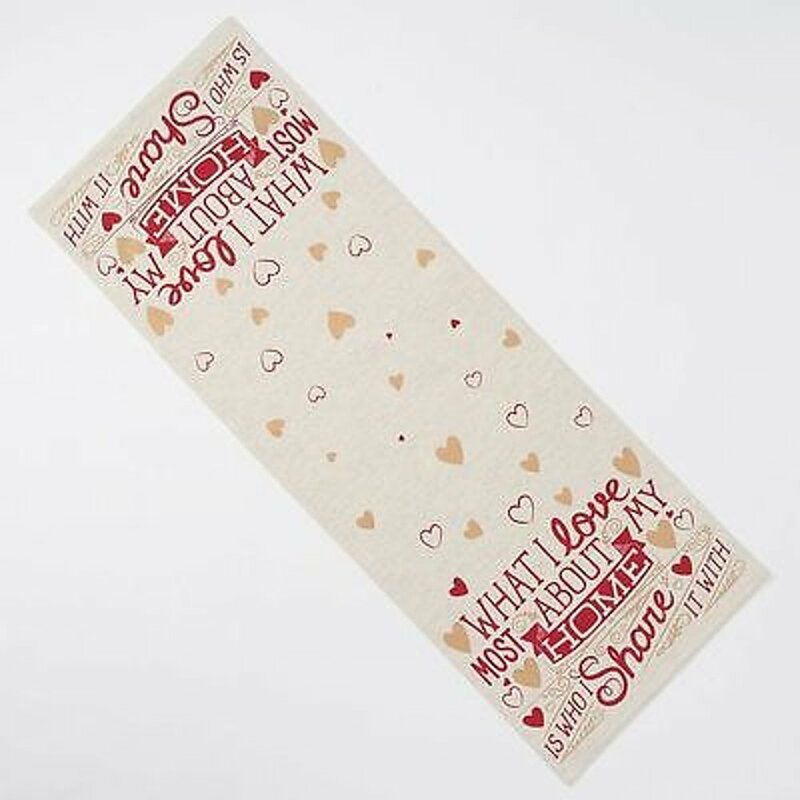 Look close at the text fabric for the cute love themed phrases. 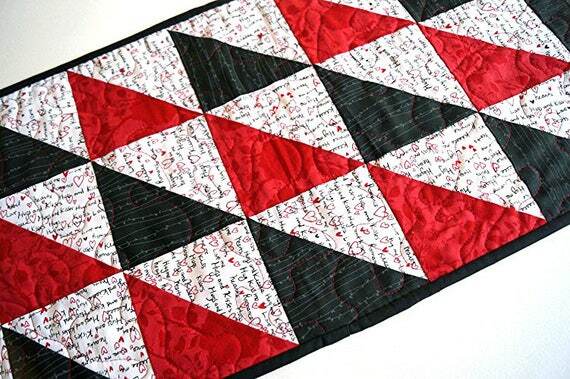 This was pieced and free motion quilted with half square triangles in red, black and white on my sewing machine in my smoke free home. I quilted on my machine using a meandering stitch. The middle layer is Warm and Natural’s cotton low loft batting. 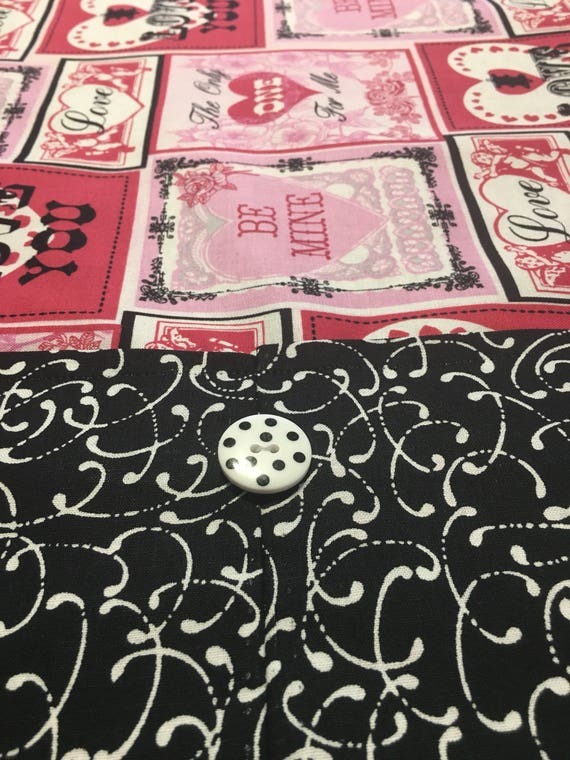 This allows the quilt to lay flat, not puffy like some quilts. 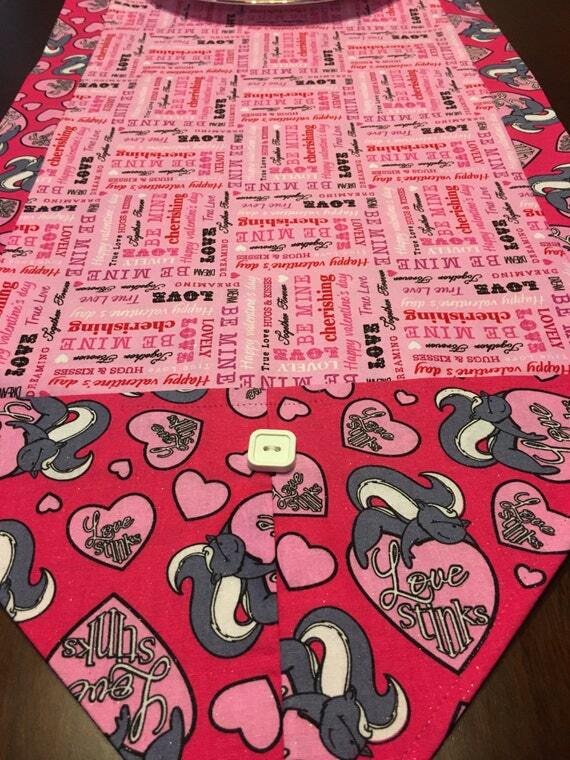 The back of the quilt is a cute heart fabric. Machine washable. May use a hot iron.